Phew. *wipes sweat from brow* That was one amazing month. For nearly three straight weeks it was warm and dry. The weather was so nice that when rain started falling last week it felt like a relief. It’s watering in all our seeds and transplants. It’s giving us time to regroup. We have been doing (or paying for) a lot of infrastructure improvements out here. 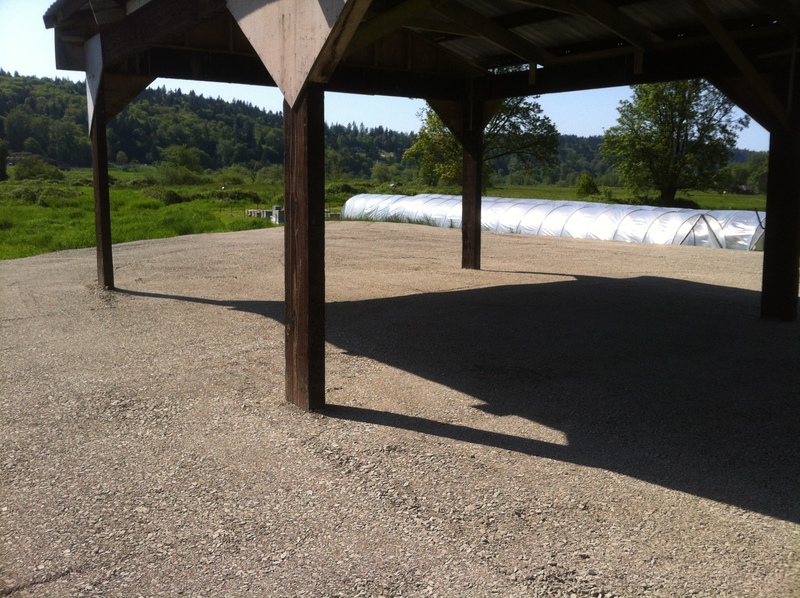 During every dry-ish spell from January through mid-May we’ve been getting truckloads of fill delivered to build a farm pad. 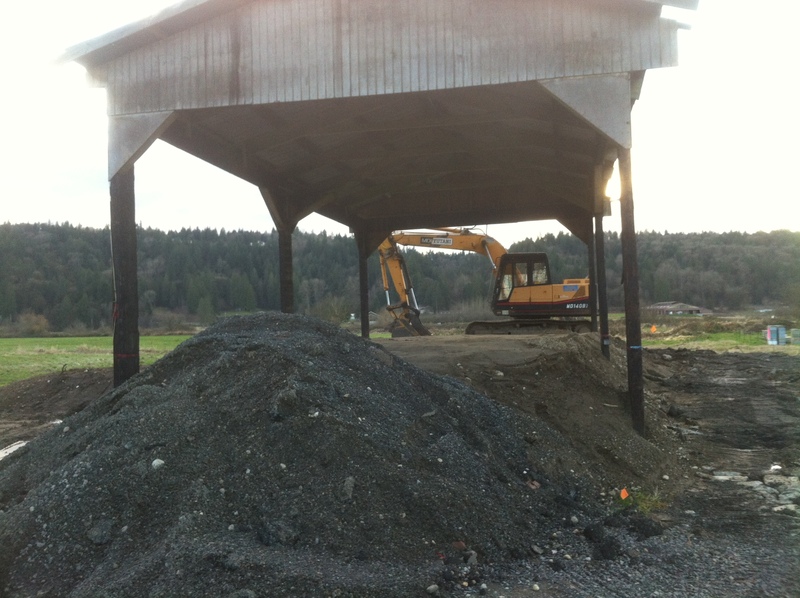 Hill of fill… it took about 500 dump truck loads to build our pad. Top of the pad. 5000 square feet, raised up 4 feet. 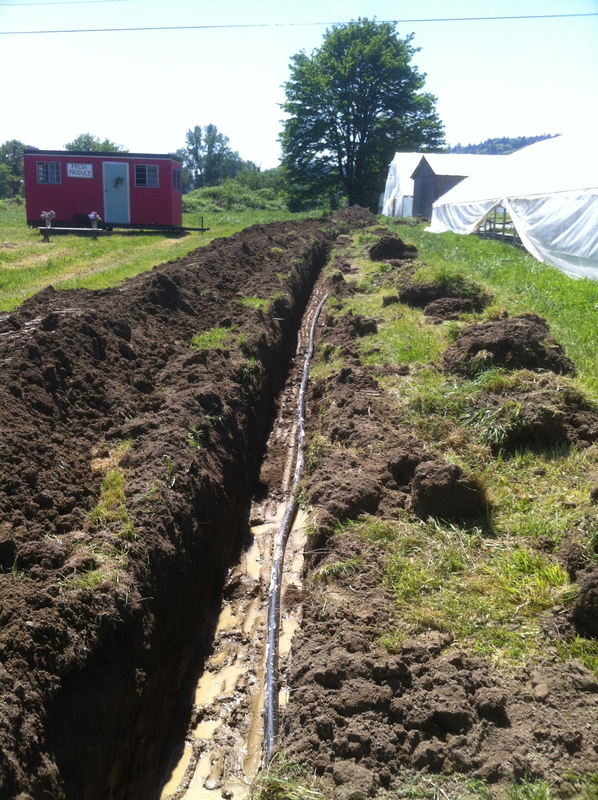 While the excavation guys were here with their heavy equipment, we had them dig us a trench to bury some irrigation line. Now we don’t have to disconnect the hose crossing the driveway every time we leave the farm. Watching all the heavy machinery doing grading and leveling work got us thinking… Despite the wonderfully dry weather, we have a field on our farm that still hasn’t dried out enough to work. It’s lower than all the rest, it’s where about half our farm drains to, and its drainage is blocked by the driveway. Even after those three weeks of warmth, there was still standing water in parts of this field. We had hoped it would be dry enough to use this year, and it should be by mid-June. But we’ve decided to let it sit another year. Instead, we are going to hire the contractor who built our pad to grade it and improve the drainage so it’s usable earlier and more consistently…. we are hoping that happens sometime in June. Because we’ve decided to take this area out of production this year, we needed to find more ground. 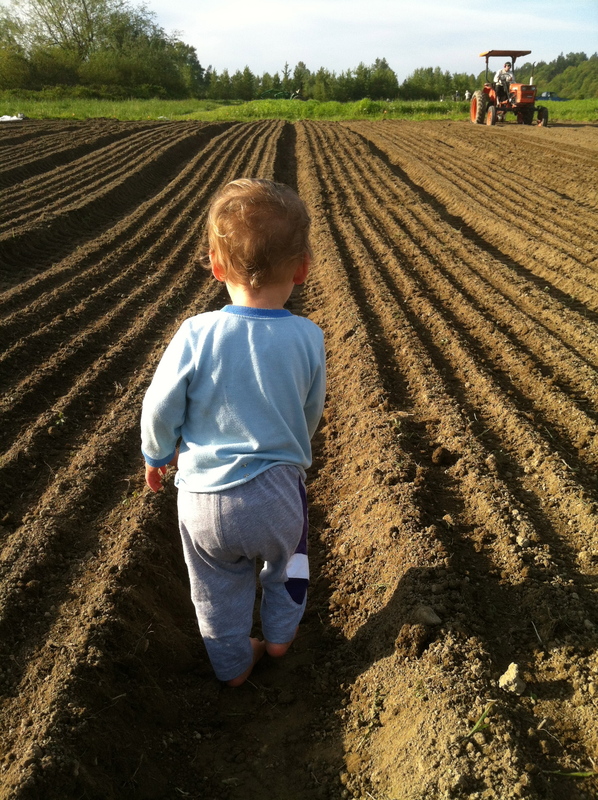 We talked to our neighbor, and he let us plow an acre of his property. Until a few weeks ago, we’d always hired someone to do plowing for us. It’s something that’s difficult to do well, and when it’s not done well, can cause you lots of trouble down the line. But, a different neighbor happened to have an old two-bottom plow lying around and I wanted to try it out. Now, the way a plow works is by inverting ribbons of soil. The grass (or whatever was growing there before) is killed or set back by being turned upside-down and deprived of light. A bad plow job doesn’t invert the soil completely, resulting in strips of grass that keep living. 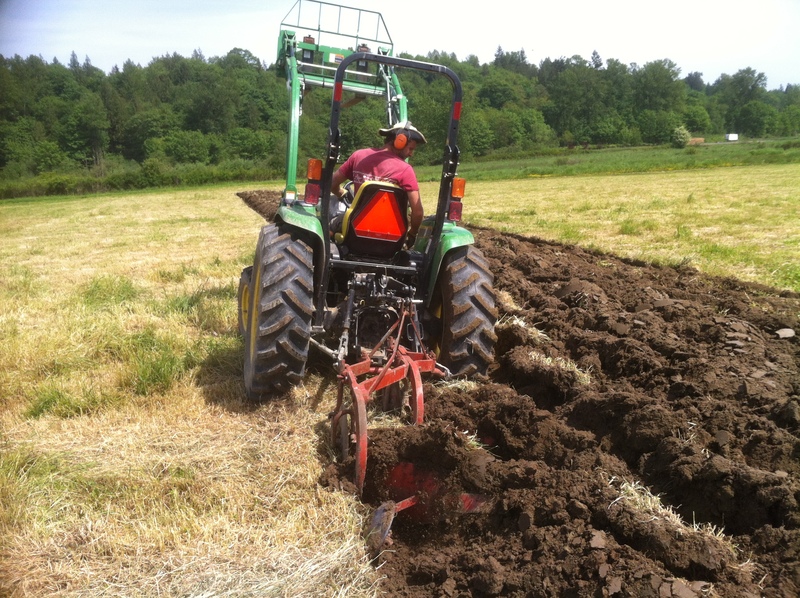 Our 1-acre plowing experiment went fairly well, but it was far from perfect. We’ll be planting easy-to-cultivate zucchini and winter squash there, so hopefully we’ll be able to stay on top of the grass. 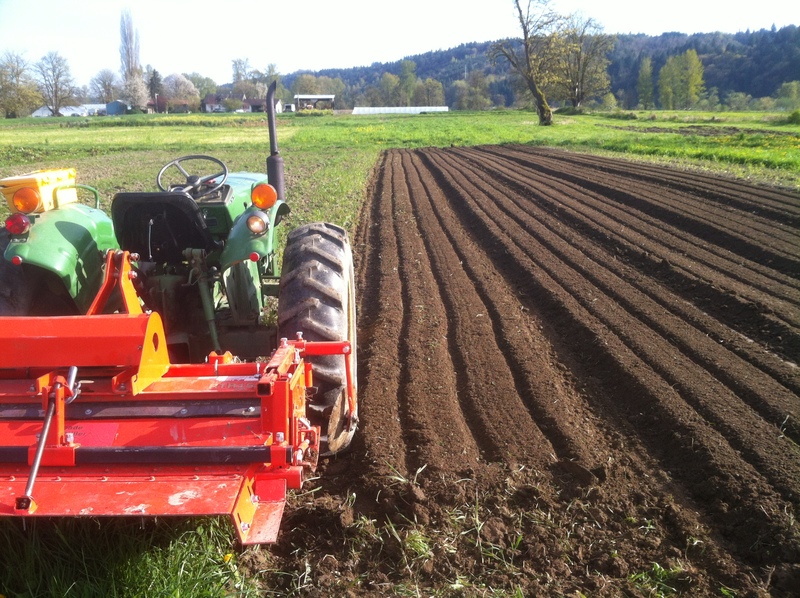 Speaking of cultivating, we’ve had the opportunity to do a bunch in the warm weather. The thing about killing weeds, whether by hand, with a hoe, or using tractors is that it doesn’t work nearly as well when the soil is wet. Hoes and cultivators don’t move through wet soil well, and even if they did, uprooted weeds reroot easily when there’s moisture available to them. 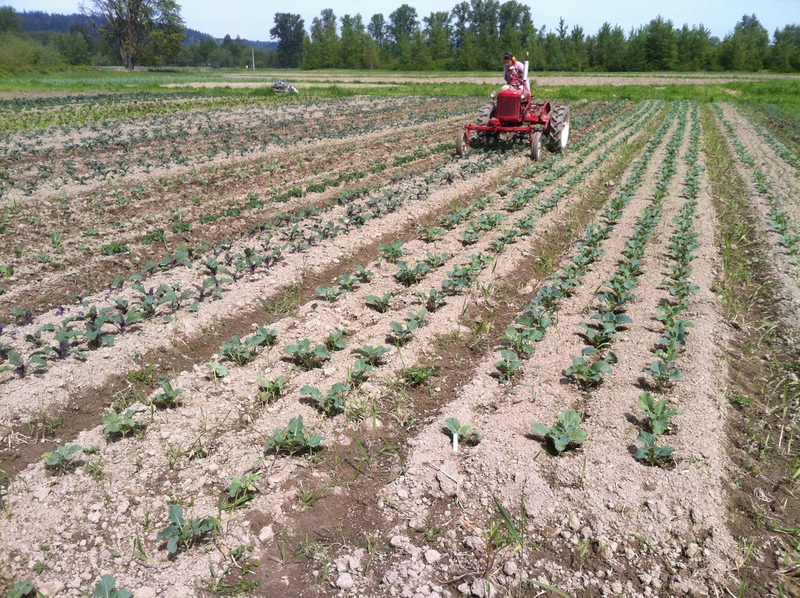 We have been using the Farmall Cub with a set of 4″ sweeps to cultivate bigger plants that don’t mind having soil thrown around them. We also went up to Farmers Equipment in Burlington and bought a set of shanks, clamps, and beet knives for the Kubota 245H. Beet knives work well for smaller plants that you want to keep clean because the knives only throw soil in one direction. 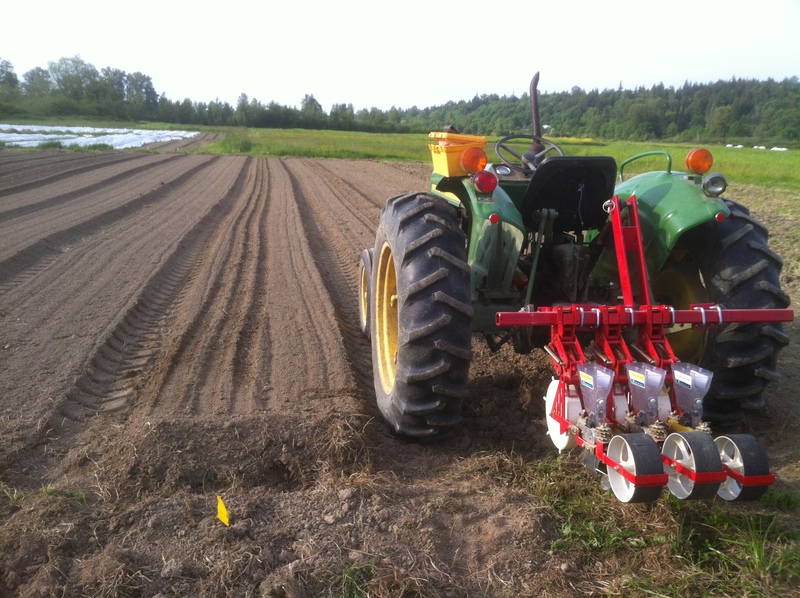 The other new cultivator tool we invested in this year is a tine weeder. 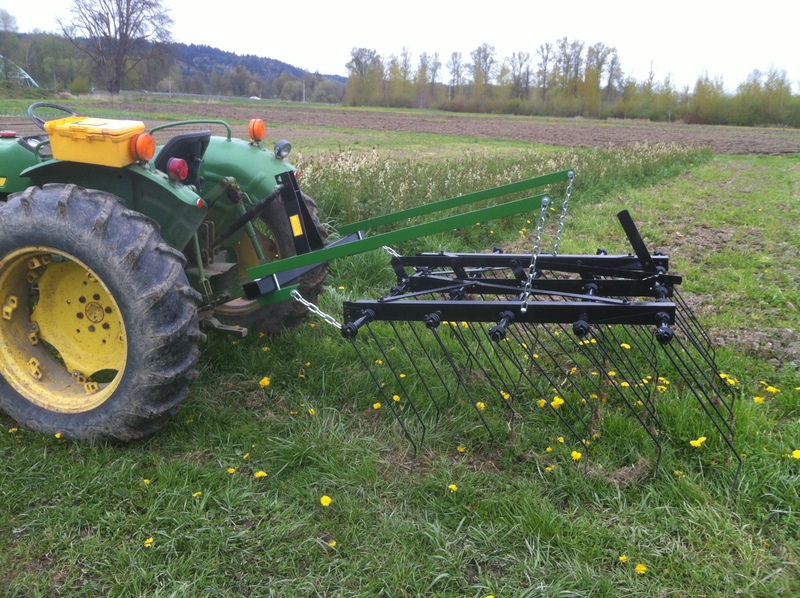 The tine weeder is neat because it tickles the whole bed, including the crops we planted, with it’s tines. The tines uproot weeds when they are at what’s referred to the “white thread stage” but it doesn’t harm (much) the plants we planted. 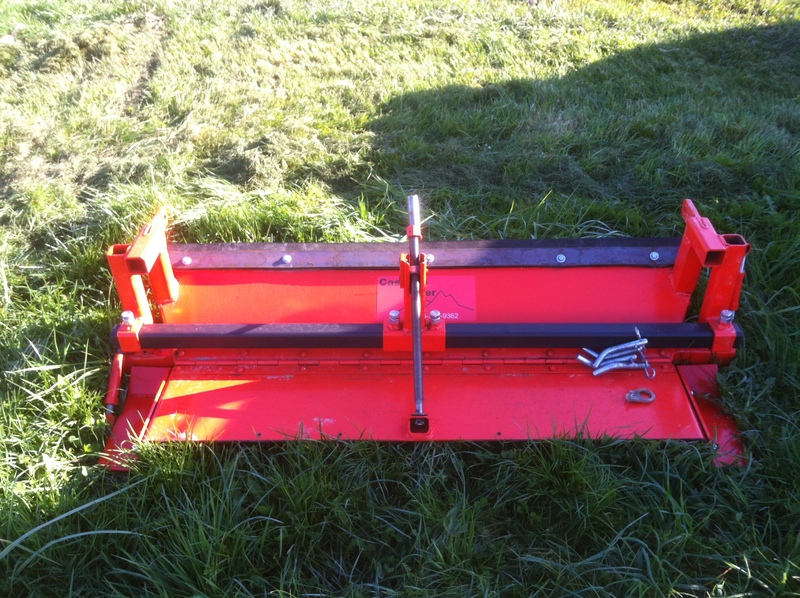 So far, we haven’t used the tine weeder enough to say whether it was worth the investment. For some reason, it hangs from the 3-point frame by chains. This made it hard to adjust properly. 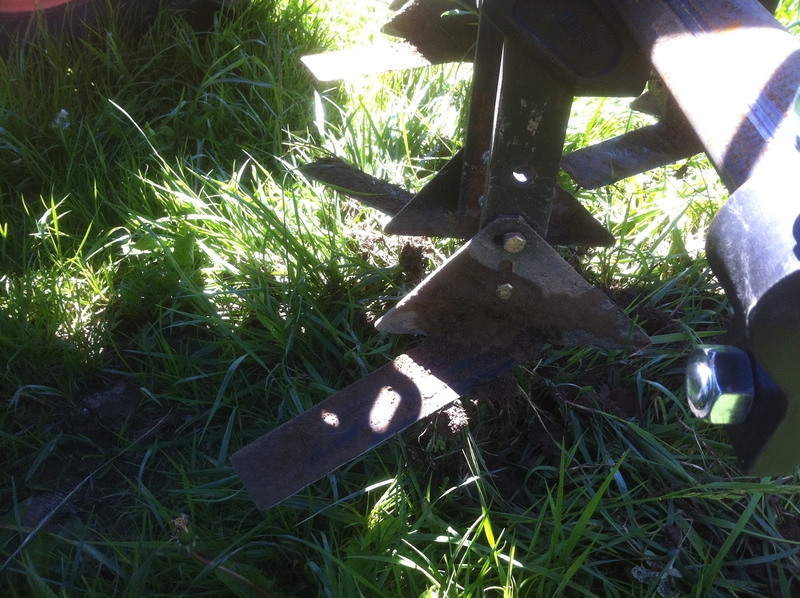 Next time I have a free minute, I’m going to drill holes in the frame and bolt the tine weeder to it. Of course, we’ve also been spending tons of hours seeding and transplanting. 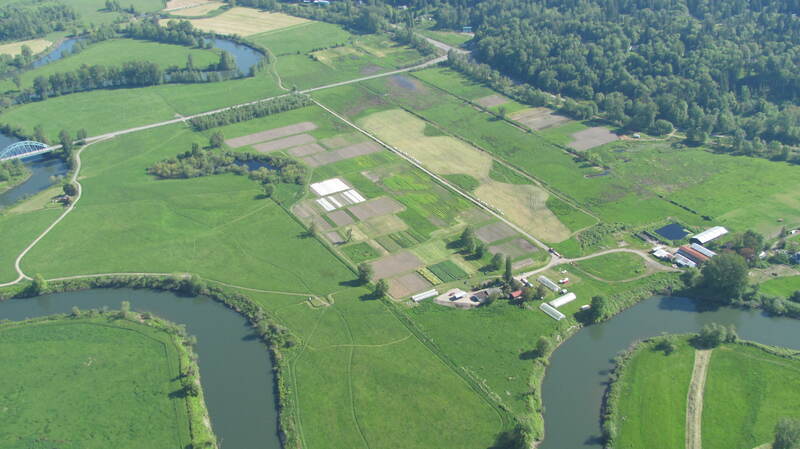 We now have over 3 acres planted, and have already started turning in our first few succession plantings of salad mix ingredients, turnips, and radishes. Lastly, a quick update about our bed shaper – it’s awesome and has saved us countless hours so far. Not only do we get a tilled and marked bed in one pass, but the increased uniformity of our beds has made cultivation way easier. If anyone out there is interested in having Gary build you one, I recommend giving him a call – 206-900-9362. He hasn’t figured out a price yet, but my guess is that it’ll be somewhere in the $1000 range. Bed shaper disconnected from the tiller. It takes less than 5 minutes to take it off/put it on. Well, that’s probably all we have time for today. There are still thousands of little plants in the greenhouse asking to be transplanted, and millions of weeds in the field needing to be attended to… Happy spring! So lovely to follow you in the planting season. Here, in Lakebay, we’ve arrived home after a month in France (gone again). The soaker hoses, plus the rain, resulted in a jungle of a garden. But I’ve done too much using the maddock, so now am recovering from a back sprain. Quel domage! Still, it’s all so beautiful. Lush, green, full of promise. We’re growing many lettuces on our deck, in pots, as well as in the vegy garden. So impressed by life in France: the pace, the bountiful, beautiful, organic produce, cheese, bread…everything. They revere food, and you can tell in the taste. Loved baby in the fields! Great posts! Vicariously from Viet Nam. What is your irrigation system like? Do you have a water wheel and just use overhead? I don’t see any drip in your photos. We use drip irrigation. We have relatively short beds – 130′ – so it’s easy to move drip tape from one bed to another. That and a wet spring means we haven’t had to irrigate much. No water wheel, but we do use a Hatfield transplanter from Johnny’s when the soil allows.